Built in 1962 with spectacular views of Pikes Peak, the Swiss Chalet offers continental cuisine prepared thoughtfully. Enjoy lunch or dinner Tuesday through Sunday either in our quaint dining room or comfortable patio. We were mid-lead that it was similar to Pepper Tree from the staff at Pepper Tree. It was very disappointing taking my sales team to lunch for a celebration. Lots of items on the A frame board weren’t available. No menus were provided, just pick off the board they brought to the table. Love love Pepper tree. This is not Pepper Tree. What a wonderful cozy and romantic place. The food and service were impeccable and impressive.., a thumbs up for our return! Great restaurant. It was perfect for a romantic dinner with my wife. Have never had a bad meal there. Always wonderful, friendly service. Our favorite place to eat in the area. As always, we had a wonderful experience at Swiss Chalet! Already looking forward to our next visit! Katie, our server, ended up working the chalet by herself and did a great job. No one minded a bit longer wait and she was attentive as always. Food is always great and is our go to for birthday and anniversary. This place is cute and kitschy for sure - but the he food is outstanding. With a gorgeous view of Pikes Peak we fueled up before heading up the mountain. We were there for lunch and enjoyed homemade soups and sandwiches. Definitely worth the drive! You should let people know that you will get a very small glass of wine filled only half. All else was acceptable. We had the best dinner we've had in years! And, the atmosphere was perfect. Excellent food and service. Would highly recommend! It took us almost an hour to even see the menu and we had a reservation. We were there for an hour and a half before we got our food and it was over-priced for the quality. I give tough reviews (you have to change my life to get a 5-star). Lived in Germany for 3 years and love the European feel of this cozy place. Jaegerschnitzel was superb! Perfect location for "date night"
Usually the food is outstanding, but that night it was very bland. No outstanding flavor of the entree's, salad was terrible, asked for house dressing and they maybe put 2 tablespoons of dressing on it. Our Server we seen her 3 times thru out dinner, we had to ask another waitress for more wine and iced tea. Usually the Swiss Chalet is the upmost experience for dinner, but this was very depressing for what the meal cost. We probably won't be back. Which is a shame.We really enjoy the Swiss Chalet. From the moment we walked in the door we were greeted and catered to throughout our entire dinner. The food was great and their selection of wine was vast. Would highly recommend. We were very disappointed. The room is charming. However the bathrooms are old, not very well cleaned and cold. The staff was attentive at first but when it became obvious that we were not enjoying our dinner they became very scarce. They were quick to take a first drink order and delayed each course in hopes of more drink orders. The cheese appetizer was okay but each course was downhill from there. The salad option was limp, boring and way over dressed. The filet special and the tournedos of beef were not cooked as ordered and were cold. We will definitely not be returning or recommend. The nicest place we have been for Valentine Day dinner. This was the the second time we have been to Swiss Chalet for Valentine Day and have not been disappointed. The food and service are both great. Good service and love the environment. Prices are s little high. A favorite of ours. Know the owner. He has another great restaurant, Peppertree in Colorado Springs. Excellent. Wonderful Valtentine's dinner, as expected. Personal attention, excellent food, superb atmosphere. Thanks! The entrees were outstanding at lunch (Jaeger schnitzel and Lobster Mac-n-cheese). 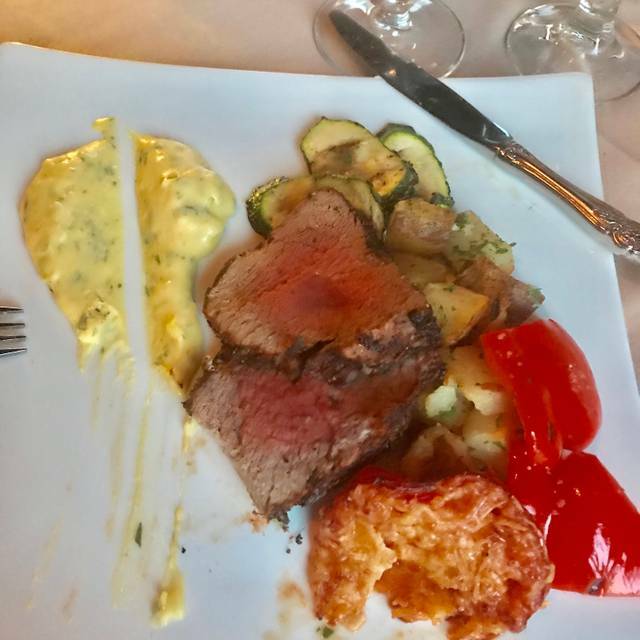 We have been to the Swiss Chalet 3 times .Each time has been superb ,the food ,service,wine,and the atmosphere were just what we are looking for . Excellent in all respects, as always. We made our reservation on short notice, and were greeted at the door as we arrived for an early dinner. There was live rose on the table, and were served delicious meals with quick and attentive service. Intimate setting for good conversations. The best. The service was excellent as was the food. Quaint atmosphere was enhanced by being able to hold a conversation without raising your voice. Highly recommended! A lovely place to go for delicious food, excellent service and a nice relaxing atmosphere. We had a fantastic dinner. Katie is amazing and the food was fantastic! My wife is actually from Geneva, Switzerland and she was impressed with the fondue. My filet was a tad over done and I was up all night with some lower GI issues. Oops! Service was slow although our waitress was pleasant, she seemed to be the only one working the entire place with some backup form another lady. We were there close to 30 minutes before our order was even taken. Too bad really. Could've been so much better experience if more waitresses were there. The Swiss Chalet in Woodland Park CO has been a favorite of ours for over 20 years. 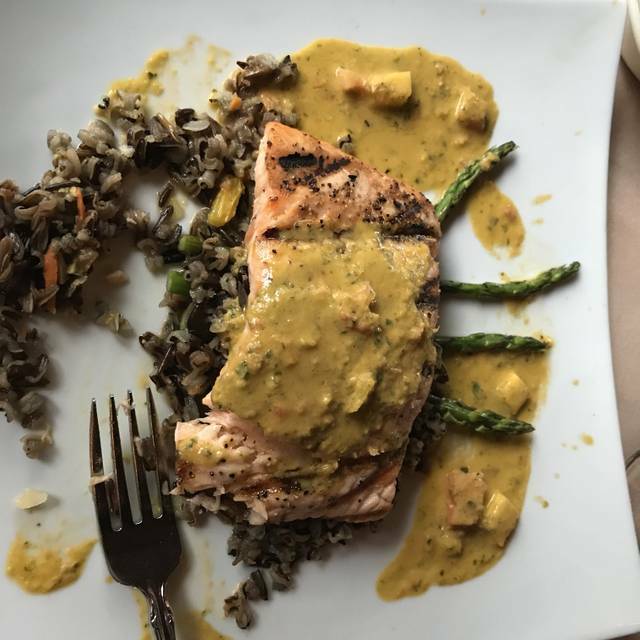 It has always exceeded our expectations with the entire dining experience. Neil and his staff always give you the intimate service you would expect at a fine dining established. I recommend the Swiss Chalet to anyone, local or visiting! This was a special event but we go to Swiss Chalet on a regular basis and it never disappoints. This was our 3rd trip to Swiss Chalet. The food was not memorable, the wine was good, but the ambiance not so great. There was music playing for a while which was nice, but that stopped. The most unpleasant thing was we were seated where we could see a steady stream of people going into and out of the bathroom. Not conducive to a nice meal. The Ambiance was spectacular we sat by the fireplace it was very quiet we were able to enjoy our conversation. It was quite romantic especially for first date. The food was very good the service was excellent the price was a bit on the high side. Food was delicious, service was not rushed! Had a wonderful evening! I would give this five stars and I’ll tell you why here in a sec. My husband and I decided to go here for a date night while in town on a getaway. The food was really really good. The place is quiet and quaint and perfect for a date night. We had the fried avocados, salad, filet Mignon w/Au gratin potatoes and asparagus with cheese cake for dessert. Here is where I have some issue. Again the place was quiet and quaint. They only had two waitresses working when we arrived for a 6 o’clock reservation. I understand why you would not want to have a lot of waitresses based on size. But when you’re paying for an expensive dinner you also expect the service to come with it. Very nice, they just did not have the time to take care of us adequately. They did not stop and ask if we needed another drink , and had to ask a few times, we saw our salads sit in the window for at least 10 minutes, so therefore when our filets came out they were not fresh off the grill, while still really good they could’ve been better. A third waitress finally showed up around 7 but still they all split each other’s responsibilities. Again I get it but please make more of a conscious effort on this. They also payed more attention to the locals. I get that as well but locals aren’t the ones that make reviews. Great place overall. Our entire experience was excellent! The ambiance, the food, drinks, service were superb. We also appreciated not being rushed. Recommend highly. They raised their prices for New Years. The escargot had no taste and was $12 for 6. The scallops were very good but were $36 for three and a cup of soup. The recommended wine was $12 a glass and not very good. We celebrated New Year’s Eve at The Swiss Chalet. We loved the ambiance of the cozy chalet with the fireplace casting a warm glow. The menu had a tasty variety. Everyone in our party had something different, and we all enjoyed the food and outstanding service. We will return on our next special occasion. Always enjoy eating at new places and our New Year’s Eve dinner at 8,500 ft. In Woodland Park did not disappoint!